Adloph Sutro, entrepreneur and later mayor, had built his estate on Sutro Heights nearby and would have none of the shenanigans. Money can solve any problem, right? He bought the Cliff House and chased out the riffraff. But good karma was not on his side. For the second time, a ship ran aground. This time, however, the schooner was loaded with TNT and exploded, damaging the Cliff House above. The explosion was heard throughout the City. Sutro repaired the restaurant only to see it burn down soon thereafter. The self-made millionaire would not be deterred and rebuilt it in grandiose style, fashioned after a French Chateau, boasting eight stories, four spires, and a two hundred foot observation tower. It survived the 1906 earthquake only to burn down once again the next year. More bad luck was still to come. The President of the U.S. shut down the Cliff House as it was too close to a military base. It remained shuttered during Prohibition as well, but would reopen in the thirties under new ownership. 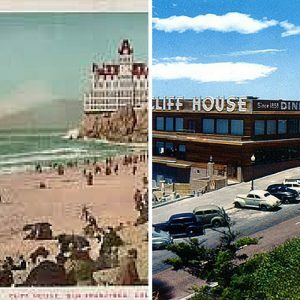 George and Leo Whitney, owners of Playland-at-the-Beach, bought the Cliff House in 1937 and remodeled it. True to their carnival roots, the Whitneys put in a tram to watch the scenery below. The latest renovation was a joint effort of the present owners, Mary and Dan Hountalas, and the National Park Service. Today the Cliff House is considered the crown jewel of the Golden Gate National Recreation Area. The remodeling restored the building to its neo-classical architecture. The effort also unearthed the old carriage road from 1914, which has been preserved as a walkway around the property. If you venture out for a meal, make reservations for a window seat in the two-story dining room where you can enjoy the panoramic view of the Pacific Ocean and Seal Rocks. By the way, the sea lions are returning. More on the tram and the seals next time. Chow!